Your dental health is important to Dr. Veronica Walker and her staff. We greatly appreciate new patients to our practice, whether through referrals from existing patients, other dental offices or through the research of individuals like you! 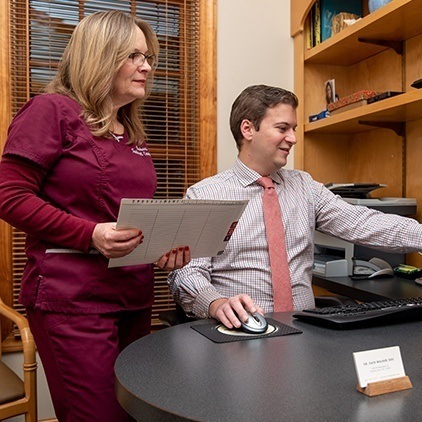 Located in the heart of the Piedmont Triad in Kernersville, NC, our office saves time on our schedule to accommodate new patients to our practice, whether from Kernersville, Winston-Salem, Greensboro, High Point, or anywhere in between. When you call to schedule your first appointment with Dr. Walker, we ask that you plan for a morning appointment and arrive a few minutes early to complete and sign the necessary paperwork. Please bring your insurance and medical information, including any prescription information. After we’ve finalized paperwork, medical history, and insurance information, you'll be greeted by Barbara DeBenedetto, our treatment coordinator. Barbara will interview you to establish your dental needs. You'll then meet your hygienist, who will carefully clean your teeth and, if necessary, take dental X-rays. After that, Dr. Walker will complete your dental exam and finally, we will review your dental plan. Prior to your appointment, you can download and complete our new patient forms from the comfort of your home. This shortens your initial appointment by letting us get to the examination and treatment faster. We’re happy to answer any questions you may have as you work on the forms, so please don’t hesitate to call. Our team knows how important it is for our patients to make the most of their dental insurance investments. That’s why we work with you to process and file your insurance claims to maximize coverage for all dental care. Please don’t hesitate to ask our knowledgeable team any questions about your policy. We’ll do our best to help you understand your plan. If you’re unable to cover the out-of-pocket costs of your treatment, we’re happy to work with third-party providers to help you find low and no interest payment plans. We offer outside, interest-free financing to make your dental wants and needs a reality with monthly payments. We will help you apply for financing from Care Credit. Click the link below to get pre-approved. We accept cash, check, money order, and debit cards. We accept Discover, American Express, Visa, and Mastercard. Please be prepared to make payment not covered by your dental insurance (i.e, deductibles, co-pays, etc.) at the time of service.